Educational toy or cute little time-waster, it's up to you to decide. 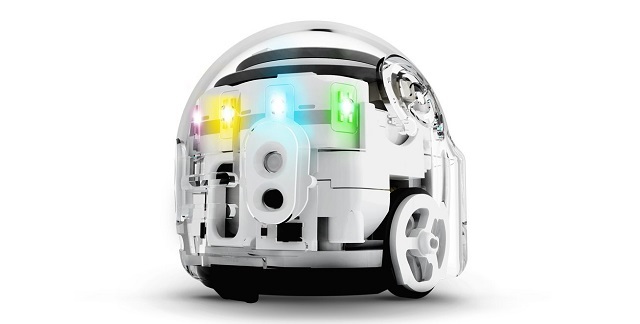 The Ozobot is a little robot about the size of a golf ball with a personality ever so slightly reminiscent of that of R2-D2. It has a set of small wheels tucked out of view on its bottom, a ring of lights around its dome, and a collection of small sensors on its front and back. When you turn it on, it will greet you with a flash of its lights and a happy set of beeps. Just on its own you can have it cycle through a few simple games ' such as having it either chase or move away from your hand. It can also be set to wander about, its sensors keeping it from running into objects or over edges. There are additional ways to play with it beyond this, though. The Ozobot is programmable in a couple of ways. First, it can read commands drawn on paper using markers with four different colors. Draw a black line and the Ozobot will follow it until it reaches the end. Cross two lines and Ozobot will randomly decide which way to turn. A sequence of marks made using red, green, and blue markers will issue it other commands. Some of these are directional, such as indicating the direction to turn at the next intersection or commanding it to turn around and move in the other direction. Other sequences are used to make the Ozobot perform maneuvers like spinning in a circle. Adding a twist to all of this is the fact that some codes mean different things depending on which direction the bot is traveling when it reads the code so you'll need to take that into account when drawing your course. The Ozobot comes packaged with four markers and a set of tutorial cards that can be laid out on a flat surface and help teach you how to program the bot using lines. Some of these are presented as a puzzle ' add the missing codes to get the Ozobot through the course ' which is a fun way to learn how to program the bot, but if you make a mistake on the card there's no way you can erase your erroneous code marks. Only afterwards did I notice that there were some stickers included in the package that had some code marks, but when I applied one I found that it didn't peel off without tearing the paper underneath, so one way or another the cards are still single-use. The line-drawing programming can be both entertaining and intellectually challenging if you approach it as a puzzle. Draw some lines and see if you can add the missing codes to get the bot from the starting point to the end. For more complex programming, you can use the ozoblockly.com website. Here you can snap code snippets together like LEGO bricks to create everything from simple programs to those that are surprisingly complex. Simple commands such as movement, direction, and light changes can be combined with more complex programming constructs such as loops, logical conditionals, and mathematical operations. Once you have a program made you can transfer it to the bot in one of two ways. The first is to hold the bot up to the screen on the designated circle. The website will flash a sequence of colors read by the bot and once it's done you can place the bot on a flat surface, double-click its power button, and it will execute the program. You can also use an app with your phone or tablet to transfer a program to it via Bluetooth, but this method wasn't as intuitive and I just stuck with the putting the bot on the screen method. You can also use the Ozobot app as a remote control, though. You can directly control the bot's movements, sounds, and colors with intuitive touch controls. Of course, this is the least educational way to play with the Ozobot, which means it's the mode kids like the most. While the block programming is a simpler method of programming than learning a language, there's still a fair amount of work involved in developing complex routines. This aspect of the bot is best suited to hobbyists and students, it may be too much to keep the attention of kids or those who just want a cute little bot to run around beeping. The Ozobot also supports a line of skins licensed from Marvel. I had the Hulk skin to play with, and it gives you the Hulk from the waist up and you slip the Ozobot in underneath. The skin has a small USB cord in the back which you connect to the Ozobot's charging port. This connection transforms the bot, changing it from a happy little bot to an angry Avenger. The app can tell that your bot has transformed, and the remote-control interface will be transformed to a Hulk-themed one. The cute little beeps will be replaced with Hulk catch phrases, and you'll gain access to new maneuvers such as 'Hulk smash'. Hulk smash was a particularly favorite maneuver of the nine year old assistant who helped me with this review, who found it endlessly entertaining to unleash the smashing maneuver on this review writer. Ozobot has a fun little personality, and several sets of stickers and cardboard 'hats' such as bunny ears allow you to add a bit of your own flair to that personality. The challenges that come out of the box and with the app can be completed pretty quickly, so after that the mileage that you get out of the bot will depend a bit on how interested you are in exploring its programming features. The educational aspect of the robot will probably require a little parental guidance and focus as most kids will want to just play around with the bot in its default modes or use the remote control app, but adults who want to tinker with programming will find the ozoblockly.com website easy enough to use.